JERANIMO multiple Grade I winning millionaire (the Eddie Read run at 1 1/8 Miles and Shoemaker Mile) who earned $1,525,364. JERANIMO won eight graded races including the G2 Oak Tree Mile on the turf in 1:32.61 with a 108 Beyer; and G2 Strub on the main track in 1:47.63 with a 104 Beyer. JERANIMO 3 times Breeders Cup participant (Mile twice and Turf Sprint). JERANIMO retired at age 8 after winning the G2 San Gabriel a record 3rd time in 1:46.00. JERANIMO a throwback to sound horses with racing longevity. 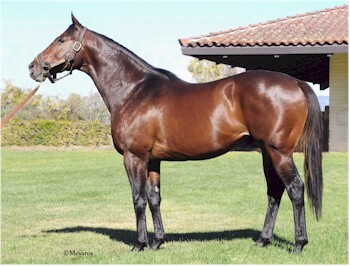 JERANIMO a versatile stallion, wining at 6 1/2f, 1 mile, 1 1/16 and 1 1/8. JERANIMO had an electrifying turn of foot closing the last furlong of 1 1/8 Mile in 11.20. First crop are yearlings in 2017! By CONGAREE (1998), Black type winner, $3,267,490. Sire of 7 crops. 303 foals, 221 starters, 13 black type winners, 155 winners, $14,175,393, including Jeranimo ($1,525,364, Eddie Read S. [G1], etc. ), Don’t Tell Sophia ($979,295, Juddmonte Spinster S. [G1], etc. ), Killer Graces ($451,907, Hollywood Starlet S. [G1], etc. ), Mythical Power ($821,529, Lone Star Derby [G3], etc. ), Maoineach ($141,840, Leopardstown 1000 Guineas Trial S. [G3], etc. ), Rockin’ Rockstar ($407,506, Tom Ridge S., etc. ), Conchacer ($374,757, Prairie Express S. [O], etc.). JERANIMO (c, by Congaree). Black type winner, see records. Wealthy Aviator (g, by Henny Hughes). 3 wins at 2 and 3, $80,735 in US. 3rd Barretts Juvenile S.-R (FPX, $12,120). Tizgale (f, by Stormy Atlantic). Winner at 2 and 3, 2014, $65,700 in US. 3rd Jameela S.-R (LRL, $10,000). Deployingresources. 3 wins at 3 and 4, 2014, $40,620 in US. Tiz a Knight (g, by Tiznow). Winner at 3, $45,500 in US. Holy Macanaw (f, by Mr. Greeley). Unplaced at 3 in US. Placed at 3, in Can, 14,000 CAD. (Total: $12,435) Producer. JERA (f, by Jeblar). Black type winner, see above. Acceptable Jill. 5 wins, 2 to 5, $80,818 in US. Logistical (c, by Baldski). Winner at 2 and 3, $31,910 in NA. 3rd Affirmed S. [L] (1 div) (CRC). Line of Fire (f, by Line in the Sand). 5 wins at 2 and 3, $74,896 in NA. Producer. Dr. Lane (c, by Baldski). 3 wins at 2, $32,280 in NA. Vera Belle (f, by Not for Love). 4 wins at 4 and 6, $104,445 in US. 3rd Opelousas S. (EVD, $5,500). Lady Raven. 6 wins, 3 to 7, 2014, $122,003 in US. Baltic Lady. Winner at 4 and 5, $84,820 in US. Joeski. 4 wins, 2 to 4, $59,152 in NA. Pic Vera. Winner at 2 and 3, $55,903 in NA. Producer. Tax Included (g, by Tasso). 3 wins at 5, $18,436 in NA. Bald Reviewer (c, by Baldski). Winner at 2, $10,119 in NA. It’z All Mine. Unplaced at 2 in NA. Winner at 3, $50,800 in US. (Total: $51,780) Producer. MIZ SPOCK, by Graustark. Winner at 4, $4,340 in NA. Dam of 2 foals to race. FLY BY VENUS, by Dark Star. 13 wins, 3 to 5, $50,795 in NA. Won Ak-Sar-Ben Governors’ H, Ak-Sar-Ben King’s Plate H, Sunland Maturity, State Fair Derby, Dona Ana H, etc.At 3 Ntr Albuquerque 6f 01:09.60. Dam of NORTH OF VENUS, Go for Love. Granddam of =Alma Alegre (IRE), Maui’s Lt. Steven, Fager’s Fancy. Race Record: at 3, one win, 3 times 2nd, twice 3rd (San Felipe S. [G2]); at 4, four wins (Strub S. [G2], San Gabriel S. [G2]); at 5, two wins (Citation H. [G2], Oak Tree Mile S. [G2]), once 2nd (Eddie Read S. [G1]), twice 3rd (Frank E. Kilroe Mile S. [G1], Arcadia S. [G2]); at 6, one win (Shoemaker Mile S. [G1]), twice 2nd (San Gabriel S. [G2], San Francisco Mile S. [G3]), once 3rd (Del Mar Mile H. [G2]); at 7, two wins (Eddie Read S. [G1], San Gabriel S. [G2]); at 8, 2014, one win (San Gabriel S. [G2]). Total: 11 wins, 6 times 2nd, 5 times 3rd. Earned $1,525,364.